When it comes to exotic and luxury cars, Velocity Factor has our customers covered! We recently had the privilege of working on a beautiful 2015 Maserati Ghibli SQ4 which our customer wanted to make unique and stand out from the rest. Our staff constructed a package ranging from cosmetics to performance and got right to work! The first order was to take the factory black brake calipers and update them to a beautiful “Ferrari Red” with the proper Maserati logos. As you can see from the pictures, we did a perfect job in matching both and they added a tremendous visual “pop” to the car. Next up was to take the stock wheels in their standard silver/aluminum finish and update them to a semi-gloss black finish. Velocity Factor did this with precision and you have to agree that the combination of blacking-out the wheels coupled with the newly painted red calipers made a huge difference in the look of the car. Next up was to widen the stance and track of the car. What better way to do this than with a set of properly sized H&R Wheels Spacers to push the wheels and tires out just enough to give it a more aggressive look, without compromising the ride quality in any way. Additionally, the car was equipped with a set of H&R lowering springs giving it a lowered stance and center of gravity which always results in better handling and appearance. The quality of H&R products are extraordinary as everything is engineered in their German headquarters on all the vehicles they make their products for. The difference in looks and performance made this a wise choice indeed! Blacking-out or what many refer to as “murdering-out” the car was the next hurdle. Velocity Factor wrapped all of the silver / aluminum trim in a gloss black wrap, along with painting all of the factory badges black as well. Smoking the various aspects of the car gave the car the finishing touches needed as you can see in the pictures as well. Velocity Factor also did a complete service on this car, saving the customer a tremendous amount. We utilized OEM Maserati Brake Rotors coupled with Hawk brake pads giving the car increased braking capacity yet putting out 1/3 less brake dust for wheels that stay cleaner, longer! Clearly, the prices at the dealership are comparatively much greater than those at Velocity Factor. From brake service, oil changes, tune-ups, and more, Velocity Factor has you covered with regard to your Maserati or other exotic and luxury vehicles. Velocity Factor only uses factory/OEM parts ensuring the quality is exactly as one would get from a dealer at a fraction of the cost! 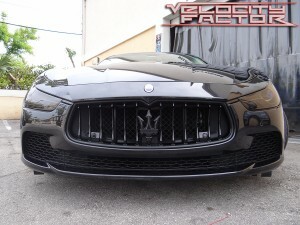 We also offer custom ECU Tuning for Maserati vehicles. This is done by appointment only as each tune is custom-tailored for every car. Along with this, Velocity Factor sells and installs the highest quality performance exhaust systems, downpipes, and more to extract the maximum horsepower and torque potential. These systems vary in style and function, with valve-controlled systems that offer the ability for stock-like sound or a deep, rich, sporty tone. Please contact us for details related to your vehicle. Stop by our facility located at 980 North Dixie Highway in Boca Raton to learn more. You can also contact us via email at: sales@velocityfactor.net or call us at (561)-395-5700. Velocity Factor is open Monday – Friday from 10am to 6pm and on Saturdays from 12pm – 4pm. We look forward to working with you with the best parts, services, and more that Velocity Factor is renowned for!